um ein Gewerbe im Bereich Bekleidung zu betreiben. to buy blouses, shirts, pants, and other used clothing to meet clients\' needs. Silvia Angelica benötigt für dieses Geschäft noch 250 US-Dollar. » Schon mit 25 US-Dollar können Sie Silvia Angelica unterstützen! Geld wird für Silvia Angelica gesammelt. Silvia needs another loan to restock her business's inventory. 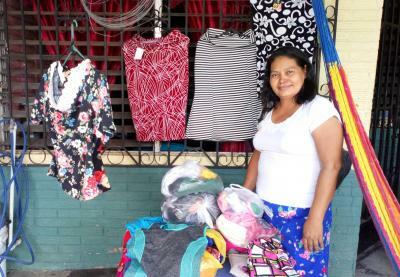 With the loan, she will buy blouses, shirts, pants, and other used clothing to meet her clients' needs. Her previous loan was helping in buying higher-quality merchandise. With this, her sales in the areas she frequents have increased, as had her clientele. She says that there have not been any changes or health issues for her family.